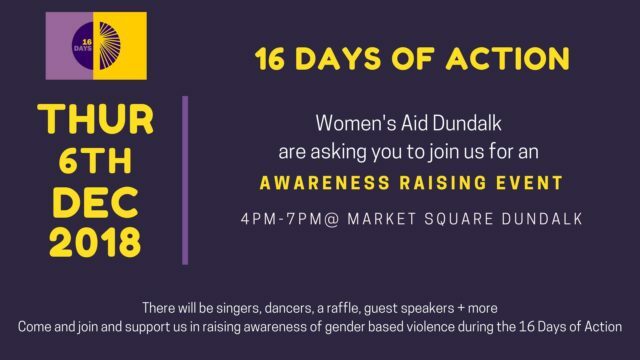 Women’s Aid Dundalk are inviting you to join us for an awareness raising event in the Market Square, Dundalk. We are holding this during the 16 Days of Action to raise awareness of the issue of domestic abuse and gender based violence. We will have some singers, dancers and a guest speaker joining us on the day. We will also have a raffle taking place for a lovely xmas hamper. Please come and join us or pop over and say hello. Looking forward to seeing you all there!